Dips are a staple compound exercise in many athletes’ routines. But the dip is not as simple as it looks. This exercise requires great strength, stability, and range of motion. Most people do not have the combination of all three, and that increases their risk of injury when performing this movement. Before performing any movement, you first need to evaluate to see if the dip is even appropriate for your body. Shoulders and elbows pain free? Able to do Push Ups? Any existing injuries that dips could worsen? It might make the dips tougher at first because you’re using the proper muscles to do the job instead of leveraging your way up. But as you become familiar with that technique you automatically become much stronger. You can control the quality of you dip by the swing of your body. If you aren’t doing the dip properly you tend to move the torso and legs during the exercise. Those who are good at dips seem to keep their torso and legs fixed on a sliding rail. Ring dips are quite a bit more challenging than bar dips because rings are extremely unstable, therefore demanding the use of numerous stabilizer muscles in your core and shoulders. Though they are the first step to the Muscle up. Loop each end of a resistance band around each dip bar handle. Assume the starting dip position, with arms extended, and put your knees against the band. Lower your body against the resistance band until your elbows are at 90°. Dip up to the starting position until your elbows are straight. This dip variation makes the movement easier at the bottom, with minimal assistance at the top. Use weaker bands as you become stronger to smoothly transition to full body weight dips. Grasp the dip bars, with your feet on the floor. Then jump up to give your body just enough momentum so that you can complete the positive rep. Focus on the negative by slowly lowering yourself down. Position your body perpendicular to a bench, with your palms on the edge of the bench and elbows extended, supporting your body. Plant your heels on the floor, with your knees slightly bent. Lower your body until your elbows are at 90°. Then dip up by extending your arms until your elbows are straight. You’ll need a parallel bars setup so you have enough room to move your body back and forth. Grasp the bars and extend your arms to get into the starting position. Then push backwards to lower yourself down and back, onto your forearms. Pull yourself forward into the bottom position of a regular dip. Then push yourself up by extending your arms to return to the start. Repeat. 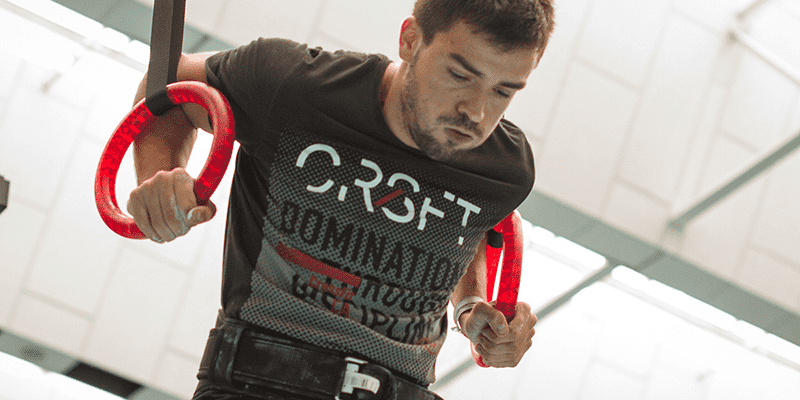 Bulgarian dips are a variation of ring dips. The difference is that, on Bulgarian dips, you rotate your wrist as you go back and forth between the top and the bottom of the motion. Specifically, you use an underhand grip at the top, and an overhand grip at the bottom.